Offshore wind offers a large renewable energy resource that could significantly decrease CO­2 emissions and reliance on fossil fuels, but the current cost of electricity from offshore wind is not competitive with other methods for generating electricity. The trend in the industry has been towards larger turbines for increased power output from each tower, thereby reducing the relative impact of installation, maintenance, and other system costs. This has led to substantial cost reductions, but offshore wind has not yet reached a competitive price point. New approaches and innovative designs that significantly reduce the cost of hardware, installation, and operation of offshore wind systems will help meet the country's long-term energy goals. 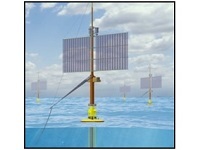 If successful, Accio Energy will develop a ElectroHydroDynamic (EHD) turbine-less wind energy system to offer a new and potentially disruptive innovation for the wind energy market and enable greater deployment of wind energy in the U.S. electrical grid, ultimately reducing reliance on fossil-fuel based electricity generation. Diversity of energy resources will help grid resiliency and reduce infrastructure vulnerabilities. The lower wind speed required for this system's operation will lead to much higher capcity factors than traditional wind turbines, lessening fossil-fuel based electricity generation, which will reduce CO2 and other greenhouse gas emissions. This technology could reduce the cost of wind energy production and provide an entirely new option for the offshore wind industry.